Kristin was born in a small mountain town in southern California. Her love of horses came naturally, with her grandparents and parents racing Quarter Horses. As a child, she competed in local gymkhanas and All-Around events. Kristin qualified for the AQHYA World Show in Western Horsemanship and was the reserve rider for Western Riding. When she was 11, she started training under multiple World Champion reiner and working cow horse trainer, Todd Crawford. She credits Todd for installing in her a tremendous work ethic and learning the ins and outs of being a great horseman. Under Todd’s tutelage, Kristin won 3 AQHYA Reserve World Championships in reining and working cow horse. She also won a Reserve World Championship in AQHA Amateur Reining, as well as several top 10 finishes. Additionally, Kristin won the NRHA Intermediate Non-Pro Futurity Championship and had several big finishes in the Amateur and Non-Pro classes at the Snaffle Bit Futurity. While reining was her focus as a teen, she still kept an odd barrel horse and competed on the side. Her father raced at Los Alamitos, and Kristin trained many former race horses into barrel horses. As well as running barrels and sliding stops, Kristin also competed in cutting events. She qualified for the National High School Rodeo Finals in cutting. When Todd moved, Kristin also spent time riding with Craig Schmersal, continuing a tradition of learning under great horsemen. The greatest contribution from Craig’s program was learning to ride ever horse as an individual and not pushing any horses past their natural limits. Kristin’s barrel racing career took off in 1996 when she bought Lady Bird’s Charger and Ittys Sis. Kristin went on to win the 1998 AQHA Reserve World Champion in Senior Barrel Racing on Ittys Sis. She qualified for her first California Circuit Finals, and won the first round. 1999 was a turning point, when her barrel racing really took off. She won 25 straight rodeos on Ittys Sis and spent most of the year on the road, learning the ropes of professional rodeo. She also bought a talented Appaloosa, Classes Kid, who had had big finishes in Derbies and in the Congress Barrel Racing Sweepstakes. 2000 was Kristin’s best year to date. She had a great winter, winning Clovis, CA, and qualified for the Pace Picante Winter Classic, progressing all the way to the short-go on Ittys Sis. She switched onto Lady Bird’s Charger for the summer run, and had an outstanding July and August. In July, Kristin left the Calgary Stampede as the Reserve Champion in the average and she also finished second in the $50,000 Bonus Round by a .01 of a second. In August, she became the first barrel racer in PRCA History to win the Big Four Award, which is awarded to the top finisher of four rodeos: Ellensburg, Walla Walla, Lewiston and Pendelton. Kristin won Walla Walla, Ellensburg, finished second at Lewiston and fifth at Pendelton. She won the California Circuit finals and qualified for her first Dodge National Circuit Finals Rodeo. She capped off a banner year by qualifying for her first National Finals Rodeo. The following three years were full of new milestones. She again won the California Circuit Finals in 2001 and qualified for the DNCFR. She started off a four year winning streak in the American West 4D Western Regional Futurity. In 2002, Kristin had a another shot at the Calgary Stampede $50,000 bonus round and again finished second by a scant .01 of a second. Kristin also finished 16th in the WPRA World Standings and just missed making her second NFR. 2003 was a tough year, with both Ittys Sis and Ladybird’s Charger out with injuries. 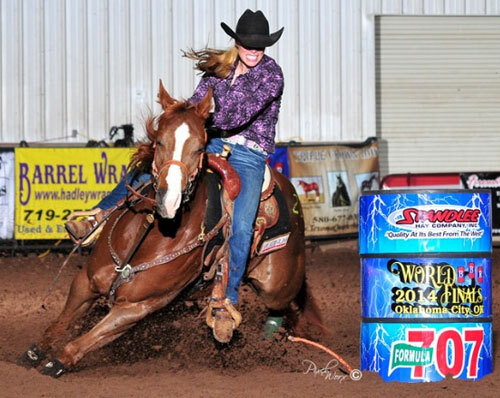 She regrouped, and came back in 2004 to win her first AQHA World Championship in Junior Barrel Racing. She campaigned Rod’s Last Ladybug and made the finals at every major futurity- the Speedhorses and the Oklahoma City Futurity. 2005 was another turning point for Kristin’s career. She has taught the horsemanship aspect of Charmayne James’s clinics for the last two years. Ladybird’s Charger qualified her for one last California Circuit Finals before enjoying his much earned retirement.Kristin’s traveling partner, Gillian Farquharson, bought Ittys Sis, and went on to much success.In 2006, Kristin moved to Athens, Texas, and started training out of John Farquharson's beautiful training facility. While no longer feeling the need to go down the road full time, Kristin has switched gears into training horses for the public and campaigning futurity horses.In 2009, Kristin took advantage of another great opportunity to train for the Shoppa Ranch. The Shoppas plan on buying quality, well-bred futurity prospects for Kristin to campaign and then resell. 2010 has been off to a great start, with Kristin riding their first venture, VF Elmers Lil Sis, into many placings and reserve championships througout Texas and Oklahome. She also hauled two Frenchman Guys colts for the Myers and did quite well on them both. In 2009, Kristin took advantage of another great opportunity to train for the Shoppa Ranch. In her first full year of training in 2010, she took VF Elmers Lil Sis to over $28,000 in earnings and made the finals at all of the major futurities, including being Reserve Champion of the Good Times Futurity as well as a slew of other Top 10 placings. 2011 was a turning point in Kristin’s life as she and her husband welcomed their first son, Jay Brown, into the world. While she took most of the year off, she did coach Kristin Shoppa to winning the AQHYA World and Reserve World Championship in Barrel Racing as well as placing second in the Texas High School Rodeo Finals and qualifying for Nationals. Kristin returned to competition in 2011 at the BFA Futurity, where she qualified Fling me a Toye for the finals. In 2012, Kristin finished out her last year at Shoppa Ranch before relocating to Seattle, WA, after the BFA in December. 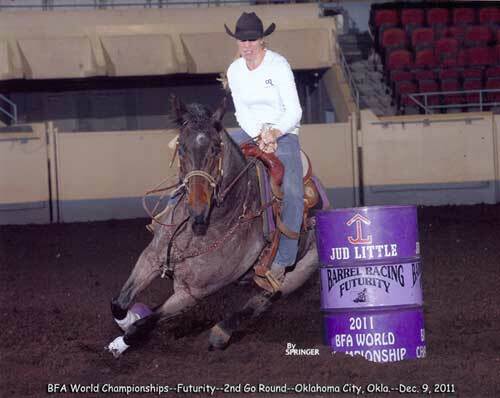 At Lance Graves' futurity, she placed 6th on Kiss Jet Goodbye in the slot race as well as placing in the average on WR Special Fame. In May, she set a new arena record on VF Elmers Lil Sis at the Diamond T Arena in Denton, TX, before making the trek to the Ft Smith Futurity. In Arkansas, she made the Futurity Finals on WR Special Fame and the Derby finals on VF Elmers Lil Sis - placing 13th on both in their respective divisions. That fall, Kristin discovered she was pregnant with her second son and she ended the year at the BFA - where she rode Toast ta Hollywood B to a 4th place finish in the first go of the BFA Juvenile. 2013 was another great year for Kristin as she added a new son to her growing family - Sawyer Jay Brown - along with moving to the Pacific Northwest. Kristin and her family are very happy to be back in Temeculah, California where they're enjoying living close to extended family. Kristin has several clinics booked for the coming year and a number of horses in training.